sobrien60, this is a very good point. The reaction rate issue does come into play when considering prebiotic evolution that leads to the first life form. It would be good if we really understood how life did arise even for the case on Earth. Jon, more on benzene in reply to your questions. There are three points that are relevant. 1) Benzene was detected in the upper atmosphere at ~1000 km elevation as Cassini flew through Titan's atmosphere. The concentration was about 2 parts per million as determined by Waite et al. 2007. 2) Benzene was detected in the vapor produced when the inlet of the probe was pressed against the ground after landing. I am not aware of any published quantitative values but it could also be at the ppm level. The third point is a calculation we did that showed if you take the solid organic material produced in Titan's atmosphere and isolate it and bring it to full thermochemical equilibrium what you get is benzene and N2 gas. However it may be a bit missleading to think of benzene as a chemical dead end. As robin pointed out in the first message, aromatic compounds at the top of the atmosphere are interesting and these almost certainly come from benzene. robin's explanation is exactly how I think of it. If there chemical potential energy that is not released due to slow rates or barriers then life can make use of this by catalyzing the reaction. to: rdstacy. Any methane life studied on Earth? No All life forms studied on Earth require liquid water to grow or reproduce. There are organisms that eat methane and others that produce methane but Earth is too warm for there to be any naturally occurring liquid methane. to: illexsqui. The variations used by Strobel. Strobel did a good job of considering a variety of possibilities especially with respect to chemistry. He even showed under what conditions the flux he was postulating would not be present - that would be the case if the concentration of hydrogen at the surface was twice what we currently think, about 0.2% instead of 0.1%. I emailed a colleague who is an expert on this measurement to ask him if its possible. next step: confirm the hydrogen conclusion and Cassini may help here, then go to Titan and get more data with something that flys, swims, or lands. to: robin. benzene? Yes indeed Benzene is a mystery player in Titan atmosphere and on its surface. It is formed high in the atmosphere - to our surprise, and it was found in the surface - again to our surprise. It is also the thermodynamically stable end form for the solid organic produced in the atmosphere. to: billclawson. DNA? Unlikely that non-water-based life would use DNA as its genetic material. DNA would probably unwind in a non-polar solvent like liquid methane. siw0n0 and Carolyn. This is in response to the question about DNA detection on future missions. First the distinction between fish (that swim) and FISH (fluorescent in situ hybridization which is way to detect the presence of DNA in a sample). As Carolyn pointed out the Cassini INMS can only detect relatively simple molecules - up to 100 AMU, not much more than benzene C6H6 which is at 78 AMU. However there is a lot of research developing DNA techniques for future missions. The focus has been on Mars missions but certainly the plume of Enceladus or the surface of Europa are likely places as well. In my opinion, these methods are good and bad. They are good because they can detect very low levels of DNA. They are bad because they only detect life that is like Earth-life. Yes, ethlyene (C2H2) is another C2 compound I should have listed. There is only one C1 but there are 3 C2 compounds. C typically has four bonds. In methane these all go to H. When there are 2 Cs then these two Cs can join with a single bond leaving three bonds for H for each carbon (ethane C2H6), double bond leaving 2 bonds for H for each carbon (ethlyene C2H4) or triple bond leaving only one bond for a H (acetylene- official name is ethyne, C2H2). Working this same logic there are many possible combinations of C3, even more C4 etc. As I said, biogenic sources of CH4 tend not to also produce C2 and C3 compounds. A quick look at the spectrum from the INMS on the March 2008 flyby seems to show comparable levels of C2, C3 etc compared to C1. This would seem to suggest a non biological source of the methane. Even if true, this not rule out biology in the system, just says that the methane is not produced by methanogens. Tiger (Tyler) and others. A brief reminder about organic molecules might help explain what the INMS can do. The INMS detects the mass of individual molecules. Methane is the simplest organic molecule it has 1 carbon connected to 4 hydrogen atoms. Total mass is 16 mass units. The next more complex hydrocarbon is ethane with 2 carbons each connected to 3 hydrogens. Total mass is 30. Acetylene is a different hydrocarbon that also has 2 carbons but each one is connected only to one hydrogen. Total mass 26. As the number of carbon atoms an organic molecule has the number of possible different combinations becomes quite large. Looking at the number of molecules with one carbon atom sometimes called C1 (only methane, CH4) and comparing that to the number of atmosphere with two carbon atoms called C2 (ethane C2H6, acetylene C2H2) and comparing these to the C3 atoms (C3H6, C3H2 etc.) and C4, and C5. We see a series going from simple to complex. The INMS can measure up to total mass 100 so that would include benzene (C6H6 mass = 6X12+6=76) but not much more. The relative concentration of C1 to C2,C3,C4 etc. may indicate a biological source. A biological source makes much more C1 than other. While non biological source tend to make them all. Quick look at the spectrum from the March flybe seems most consistent with a non-biological source. The easist way to see what the INMS can really do is to look at the results from Titan. 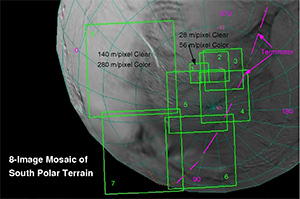 There Cassini flow down to the 1000 km level and the INMS obtained a rich organic spectrum. The results are in Waite et al 2007 in Science. Specific organics were detected up to C6H6. If we could get comparable counts for the organics from the plume of Enceladus we should be able to get a hint as to how the abundance falls off with carbon number. A sharp falloff from C1 (methane) to C2 (ethane and acetylene) would be consistent with a biological source for the methane. Hello, new to this site at the invitation of Carolyn Porco. Looking at the interesting discussion and one area that I can comment on is the methane. While it is true that methane can form as a breakdown product of organics at high temperature it can also be formed biologically. It is interesting that the microbial ecosystem on Earth that is my favorite candidate for an ecosystem on either Europa or Enceladus is based on methanogens. The usual way to tell biogenic from abiogenic methane is with isotopes - not an option on Cassini. However the ratio of ethane to methane is another way. Biogenic production of methane tends to be pretty pure methane while thermogenic production of methane make 1% or more ethane as well.